If you live in an apartment with a small kitchen, or in an RV or dorm room and you’re a fan of hearty breakfasts, you should consider getting a 3 in 1 breakfast maker. This type of kitchen appliance takes a coffee maker, a toaster or toaster oven and a griddle and combines the three into one to save space and time by allowing you to make all your breakfast sandwich components at the same time. Our best all in one breakfast maker reviews will help you decide which kind to choose. 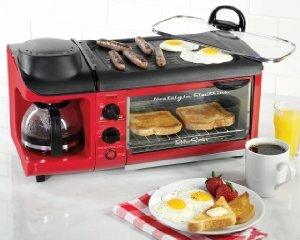 If you’re only interested in toasting sliced bread or bagels and poaching or boiling eggs while the coffee is brewing, you can get a breakfast station that features a slot toaster. If you also want to use the toast function for grilling or baking some small food item, you can also find a 3 in 1 breakfast center that features a small toaster oven with a sliding tray. Both these are very versatile gadgets. Hamilton Beach also makes a small device that cooks and stacks your breakfast sandwich components in one go. Amazon has quite a few 3 in 1 breakfast station models to choose from, but if you want to narrow your choices down to just 5, read on. In addition to the following breakfast stations, also take a look at the Cuisinart Griddler Compact Grill Centro that combines cook-top grilling and griddling with a rotisserie drawer below for kebabs and sausages. If you are really into making breakfast sandwiches, just like the types that are served at fast food joints, you will probably flip head over heals for the Hamilton Beach Breakfast Sandwich Maker. For your information, there is a single version, a double version which allows you to make two sandwiches at once, and a single version with a timer, so that when it goes off, you know your breakfast sandwich is ready. The basic unit is exactly the same with all of the same features, i.e. 3 layers to hold and toast your ingredients with one separator cooking disc that you can slide out in the middle of cooking to automatically assemble the sandwich. If you want the double version with timer or the single timed version, you can have your choice. The real key to this unit is using ingredients that fit. English muffins fit, bread will need to be trimmed to fit. You could make a pancake sandwich, but the pancake needs to be pre-cooked and trimmed to fit. If you add any meat, it also must be pre-cooked, smoked or cured but you can drop an egg raw into the top or bottom cooking ring. And although it will make breakfast sandwiches in less than 5 minutes, that doesn’t include the 2 or 3 minute warm up time the appliance requires before it is ready. This is also one of the easiest units to clean, with all of the removable parts being dishwasher safe. None of the limitations take away from the overall convenience of this unit. You just have to play by the rules of the game, making sure everything fits, and if you do that, you’ll be able to make breakfast sandwiches as good as any that come from a fast food place, if not better. You’ll also have a choice of several different colors, including red, black and gray, that will fit any kitchen décor that you have. If you are looking for an 3-in-1 breakfast making station, the Maximatic EBK-200 Elite Cuisine has got you covered. You can make coffee, fry an egg with a couple of sausages, and toast your favorite croissant all at the same time. A small griddle is located on the top of the toaster oven, and there you can fry up a couple of eggs, sausages or even hash browns. The toaster oven, directly below it, allows you to toast whatever bread you want, from regular commercial slices, to home made bread or even artisan bread types. However, you’ll only be able to get one large slice in at a time, and you can only do one bagel slice at a time too. It includes a 15 minute timer dial and 3 power levels, also regulated by a dial. Next door is a 4 cup drip coffee maker, so while you are cooking, the coffee will be brewing. It has a swing out filter basket for easy loading and cleaning and a pause feature to serve yourself a cup if you can’t wait for the entire cycle to finish. This is truly an ingenious device, and if you are lacking for counter space, have an RV or even if you are living in a dorm room, this unit solves all of your problems. Of course, the small size really makes this only practical for one breakfast at a time. If you have a family, you are going to want something else. But the price of this all in one breakfast sandwich maker rivals a regular drip coffee maker, and for that price you get a miniature cooking station, and that is some terrific bang for the buck. If you do have a family, then the Nostalgia Electrics 3-in-1 Breakfast Station is a much better choice. It features the same layout as the above mentioned Maximatic, it’s just larger in all respects. You’ll still get a 4 cup drip coffee maker, but the top mounted griddle allows you to cook 3 times the amount of food. You’ll also be able to cook 2 croissants at the same time, a fully opened bagel, or even a couple of slices of toast. The toaster’s timer goes up to 30 minutes and you can choose to use not only a toast/bake function that heats from the top and bottom, but also a grill function to cook from the top and a warm/heat function for bottom heating. The larger griddle takes a bit longer to warm up, so don’t expect an “instant on” cooking surface, and even though this unit is larger, it would also be great for an RV or a dorm room as well. The one inconvenience you may find with this unit is that there is no temperature control. The temperature only varies based on which cooking function you choose. It also costs about double the price of the Maximatic, but for larger amounts of food, or if you are making breakfast for a family, the Nostalgia Electrics breakfast station is the best choice. If you are a fan of eggs and toast, with a little meat on the side, the West Bend TEM500W may be just what you are looking for. It is the newer version of a popular Back to Basics unit. The side mounted basin hard boils 4 eggs or poaches 1 egg, and while that is being done, you can warm up pre cooked meat too. This unit looks like a stand alone toaster, and it will accept many styles and types of bread, including English muffins and bagels. You can choose how dark or light you desire it, and there is a cancel button that will pop up the toast when you want it. You can easily remove the toast once done using the lever to lift them up. There may be issues with the actual egg poacher. It must be installed correctly, or the unit has a tendency to fail after several uses. Also, the poacher uses a non-stick coating, so always remember to use plastic or wooden utensils, or you’ll risk scratching and flaking the coating. Although this unit isn’t as versatile as some, for what it is made to do, you won’t find anything better. This would be another great appliance for a dorm room or an RV. For a true family sized version of the West Bend TEM500W model, the West Bend TEM4500W Egg and Muffin Toaster will fit the bill. This unit features a full 4 slice toaster, and it will accommodate nearly any type or sliced size of bread. It even has a defrost and a bagel button so there is no guessing when you make a frozen waffle or an actual bagel. Better still, the egg cooker has the capacity to make 8 boiled eggs at once, or you can make 2 poached eggs or scramble several together. The meat warming tray will allow you to heat up pre-cooked meat, and they can all be stacked so that the food is done at the same time. Once again, be careful with the egg poacher. Wipe it down with a damp cloth, never scrub it, and always use plastic or wooden utensils to avoid scratching of flaking of the non-stick coating. But if you are a fan of eggs and toast in the morning, or any time really, this machine will get the job done and has the capability to make enough food, in a short amount of time, to feed a family. This is why it is our pick for the best breakfast sandwich maker to buy. ← What is the Best Vacuum Sealer for Sous Vide? If instead of the griddle, there was an eye where one could use whatever pan, skillet, or griddle on it, would be far more useful. Then you could cook beans, rice, fry bacon. It would be easier to clean/wash also.